I originally wrote this in Feb, 2006. You can download a PDF (with images) of this writeup (1.8mb): bhutan2k6.pdf. 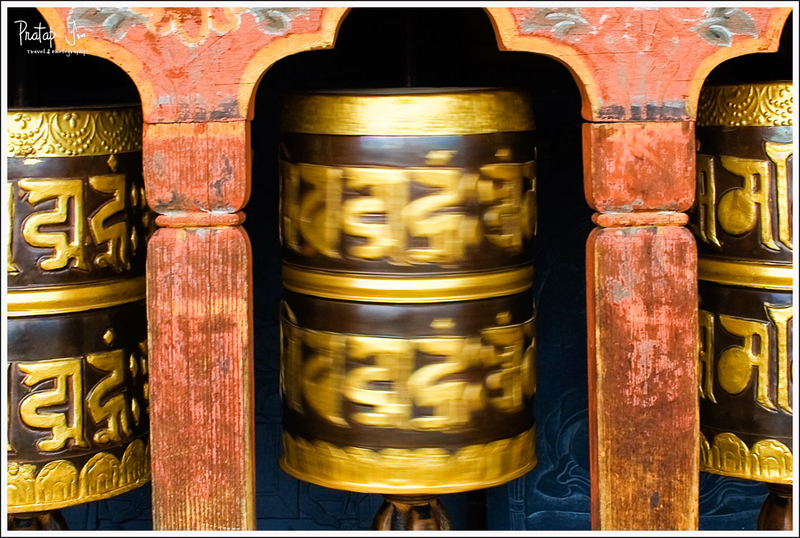 Bhutan is nestled in the Himalayas between India and Tibet. 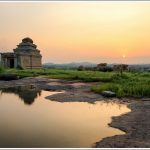 With a reputed tour operator and a little money, you can travel through the picturesque terrains of this small kingdom in a cozy 4X4, with a guide filling you with trivia that you can later recall when explaining photographs to friends. 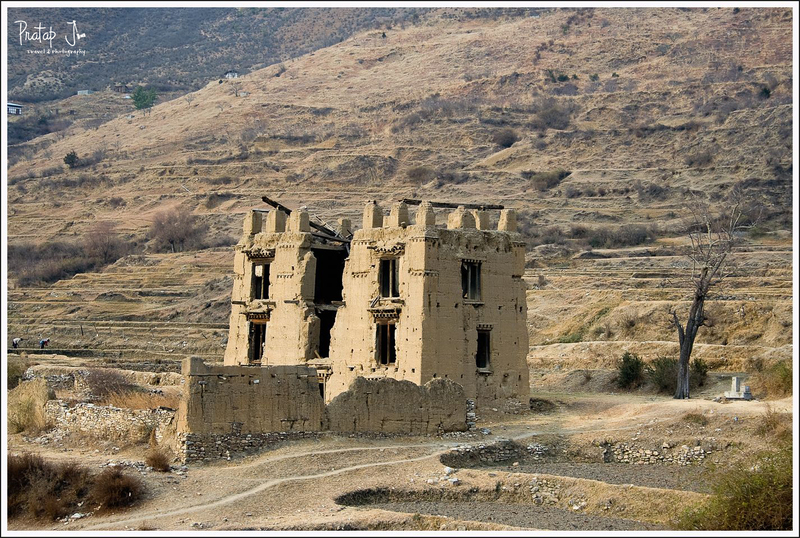 You’ll see snow capped mountains, oriental and architecturally beautiful Dzongs, do some trekking, visit handicraft stores and maybe participate in a local festival (if the timing is right). 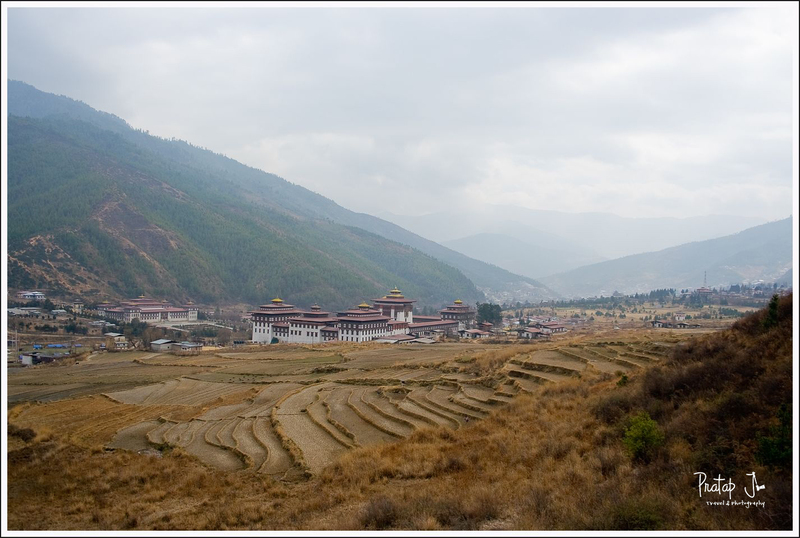 Tourism is big here, so Bhutan is very tourist friendly. 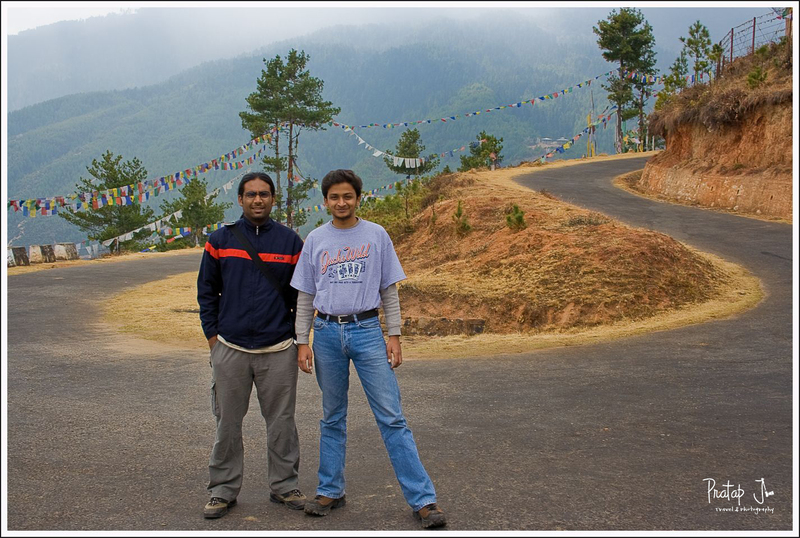 Two of us, a childhood friend and I, visited Bhutan in February 2006 as backpackers, minus the tour operator and a 4X4. captured through my camera. This travelogue is brief and only captures the broad details of the trip. 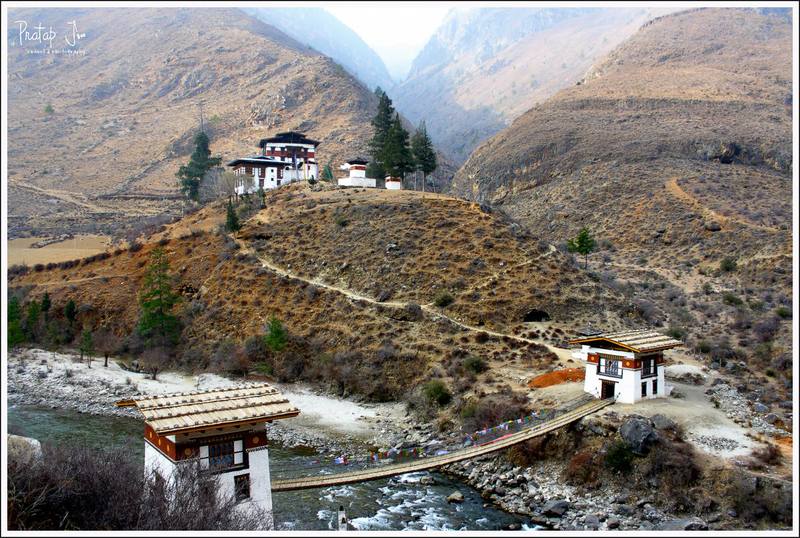 You have to be there to experience the finer aspects of backpacking to a place like Bhutan. Our trip started with us leaving Kolkata (Sealdah station) on a Sunday to catch the Darjeeling mail bound for Siliguri (NJP actually). We were late in leaving my friend’s hostel, and to add to that, the taxi driver, whom we kept reminding to drive fast, in all his wisdom stopped by a Chinese restaurant 5 minutes from the station when we asked him to pull over for food. We had to take some serious decisions and chose to risk missing the train by ordering some lip smacking fried rice. The train was to leave at 22:05hrs and the food arrived at 21:45hrs. So it wasn’t surprising that by the time we ate, paid, caught another taxi and reached the station, the train was lethargically leaving the platform. I have never boarded a moving train, but there is always a first time. 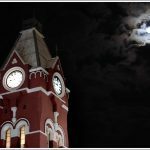 To cut the story short – we reached Siliguri in one piece and it was 12:00hrs the next day when we began our journey from Siliguri to Phuentsholing by a Royal Government of Bhutan mini-bus. The distance to be covered was about 165 km and cost us 65 rupees per head. The town of P’sholing is small but busy. Being the transit point between India and Bhutan, there are always a zillion vehicles of all kinds on the roads. 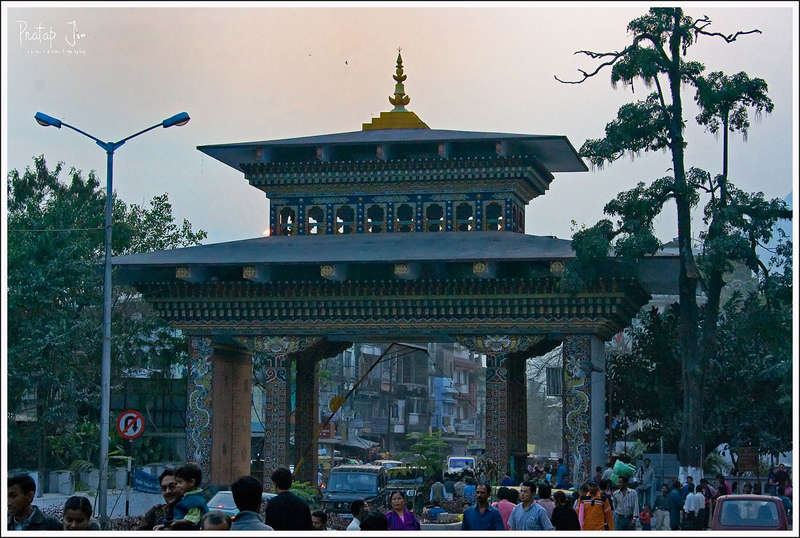 It took us 4 hours to reach this town, and we checked in at a modest hotel overlooking the Bhutan-India gate. BST is half an hour ahead of IST, so it was 17:30hrs when we finally laid our tired bones to rest. We spent some time that evening exploring our first Bhutan town, but being tired, we retired by 20:00hrs. 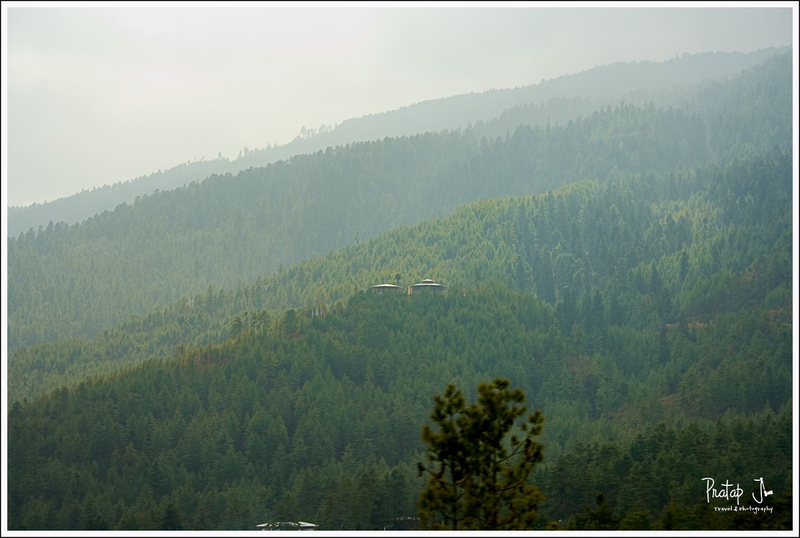 The next morning I was awake early, feeling refreshed and ready to conquer…oops, explore Bhutan. I was sitting by the balcony of the hotel at 07:30hrs, sipping a hot cup of chai and watching the busy street below when I felt my chair moving. I brushed away my mind’s suggestion that it may be an earthquake. But when my friend cried out from inside the room a moment later that his cot was shaking, it occurred to me that we were really experiencing a tremor! Luckily, it lasted for hardly 30 seconds and I was smiling thinking of another “first” I had experienced. We didn’t need any special immigration permit to enter P’sholing and spend a night, but one needs to have a permit to visit and travel in Bhutan. So we spent the morning of 14th Feb (Tuesday) getting our papers in place and left for the city of Thimpu at 13:30hrs by a bus. A passport is the quickest way to get travel authorization. Alternatively, you could use a Voter’s ID and get permission from the Indian Embassy in P’sholing to travel around the country. It was 20:30hrs when we reached the capital city of Bhutan. The air was really chilly and the bus ride interesting because of the scenery. Enroute we had to stop at 3 check posts to get our papers verified, but the Bhutanese soldiers were friendly and everything seemed like routine work. At Thimpu we checked into a small hotel again, paying 250 rupees for a double bed room. We were hungry so we stepped out of our room looking for a place to eat. The streets of Thimpu had many youngsters – most of them hanging around restaurants and petty shops. Being Valentine’s Day, our hotel owner also invited us to a party. But he seemed like a shady character so we didn’t follow him. Not finding a suitable place to eat, I enquired with a local for a good Indian restaurant (being vegetarian, we had to be specific about food). This stranger not only showed us a place to eat, but also joined us for dinner and later paid for our food! 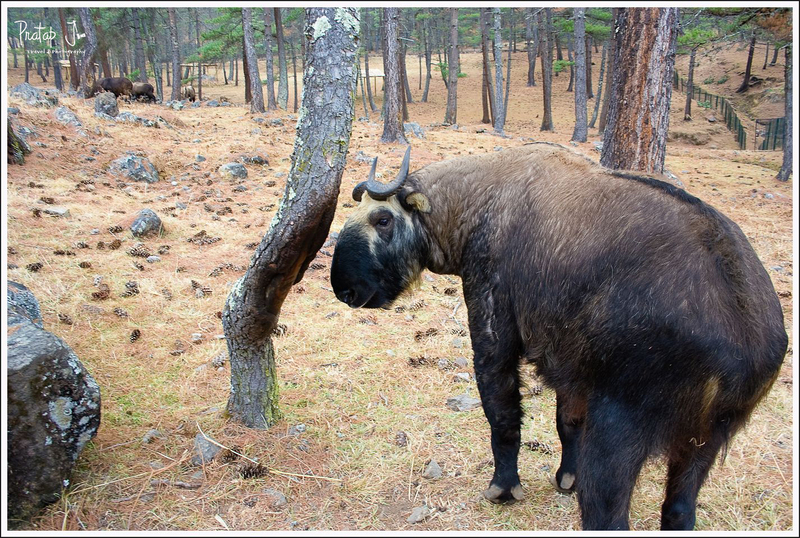 And thus we met our new Bhutanese friend – Chetin. Chetin was a civil engineer from Eastern Bhutan. 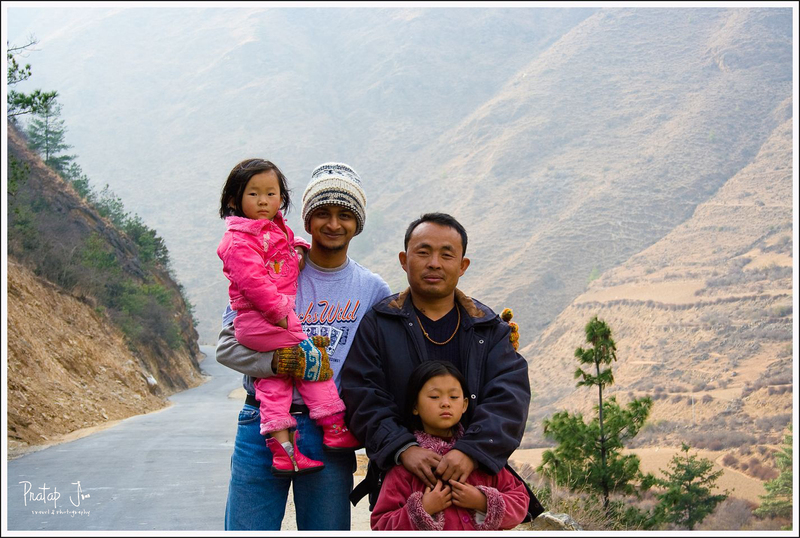 He had a family of wife and 3 kids in Thimpu and had come down to visit them. The three of us became friends over dinner and beer and he promised to be our guide the next day. 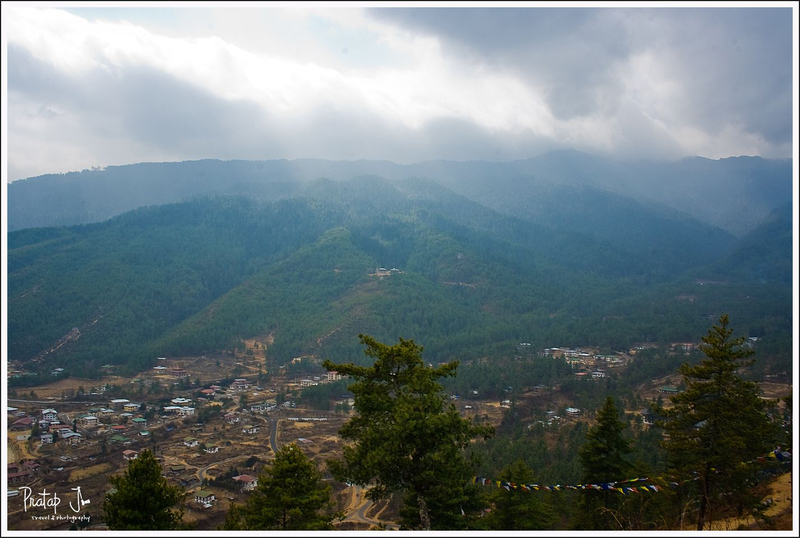 So on the morning of 15th February, we set out in Chetin’s car to see the city of Thimpu. We visited the Thimpu Dzong, the zoo (where we saw Bhutan’s national animal – a serious joke by God if you ask me), drove up to a peak overlooking the city, visited a handicrafts store and stopped to click snaps of the Tashichhodzong (now Bhutan’s Parliament house). Later Chetin took us home for a delicious lunch of red rice, boiled vegetables and some good home made wine (prepared from rice, barley and maize). When we started off earlier that morning, there wasn’t a plan of Chetin dropping us to Paro (our next destination), but the bonding really happened over the day that he offered to drive us down to Paro. With Chetin’s two daughters for extra company, we left for Paro at 15:00hrs. 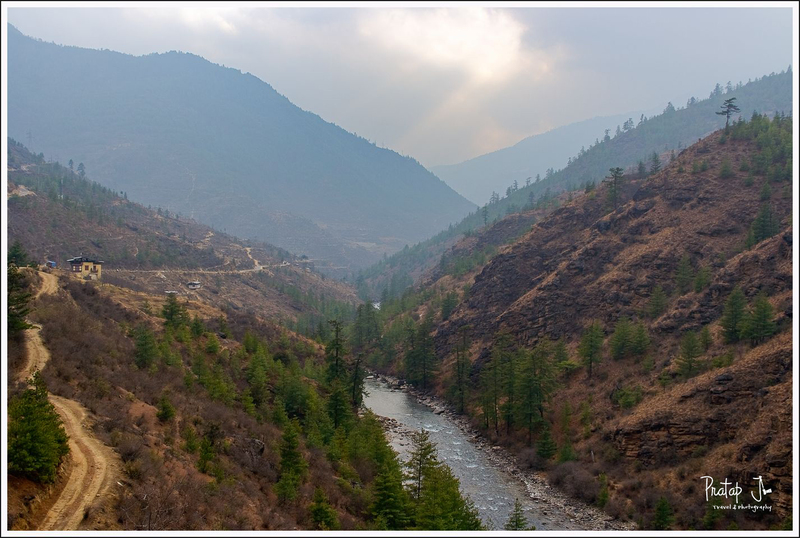 Along the way we saw some breathtaking views of the Himalayas, driving almost alongside the Thimpu River. 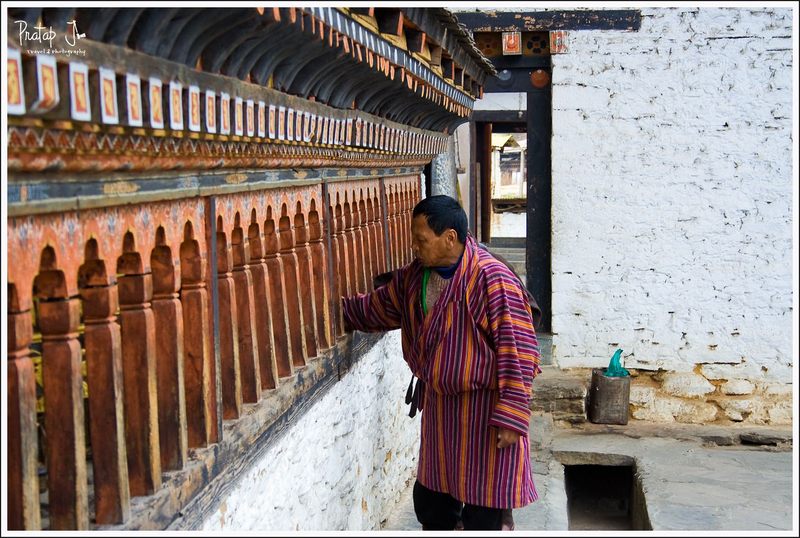 Thanks to Chetin, I was able to shoot lots of photographs, and was enlightened with loads of trivia on Bhutan. Nice post. Bhutan is a unique & wonderful country. 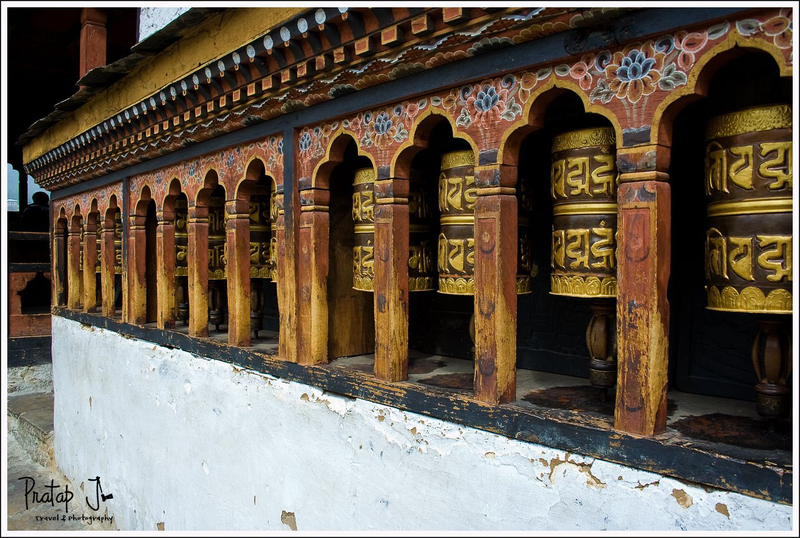 Bhutan is home to stunning views of the Himalayas, peaceful Buddhist monasteries and fun loving people. 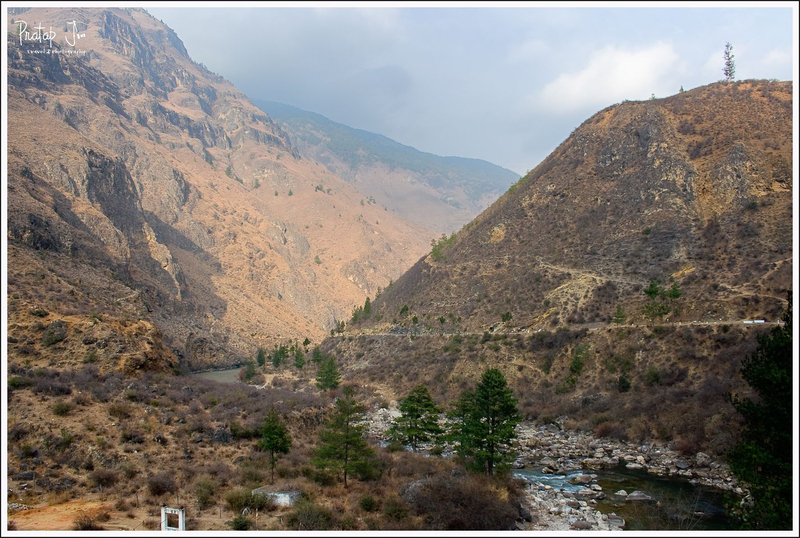 Bhutan is certainly a place where the spectacular mountains help you breathe a fresh air of life within you. 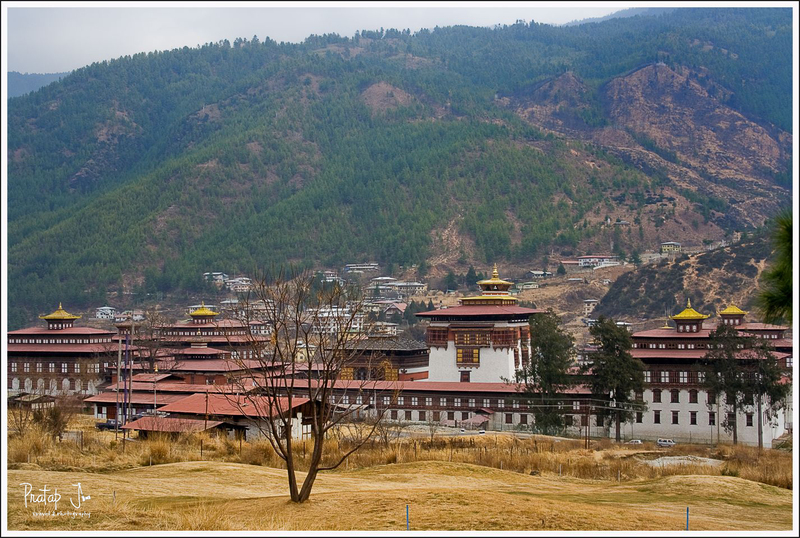 In fact, Bhutan is considered the best getaway for families, friends, romantic travelers, adventure lovers and nature lovers.